Sorry for the lack of posts. I was out of town over the weekend, and today, I have been dealing with a cluster headache or migraine for the entire day (not sure which it is, but it sure does hurt). As a result, I am much farther behind than I anticipated. I've tried everything to get rid of this thing: Motrin, ginger water, hot tea, ice, ear drops, a hot shower, sleep, TV (Yes, The Bachelor), vitamin b2...I even ate raw garlic, all to no avail. Oh well. You know what they say, tomorrow's another day. I'm finally starting to feel a bit better, so I couldn't help but post. (It's better than starting school work). Anyways, this salad has a crisp, refreshing citrus flavor, with the surprising comfort of barley and garlic hidden in there. 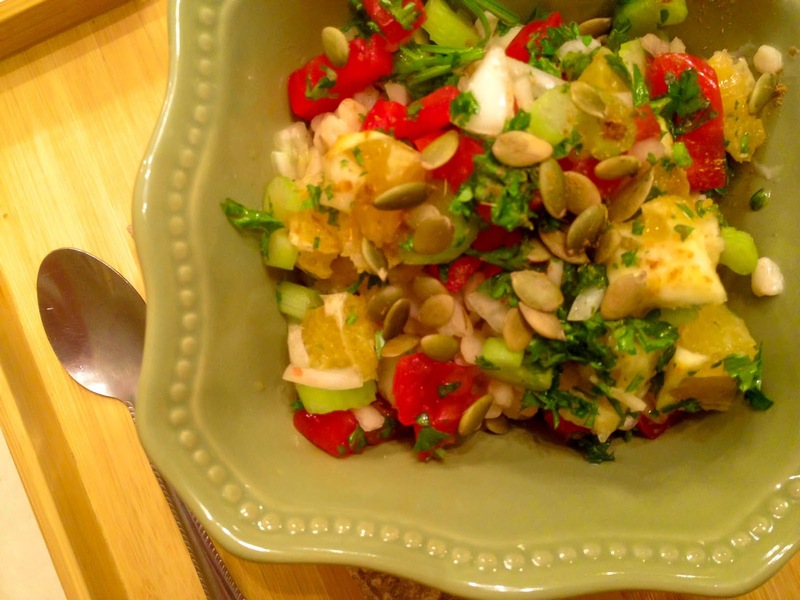 The pumpkin seeds add a nice crunch, while the cumin lends a hint of Mediterranean flavors. It's a nice and fresh meal that will definitely keep you feeling satisfied and healthy. Hope you like it. 1. In a medium saucepan, bring the water to a boil. Stir in the barley, 1/4 tsp. of salt, and fresh garlic. Continue cooking until the water is absorbed, about 10 to 12 minutes, stirring occasionally. 2. While the barley is cooking, chop up your veggies. Add the diced tomato, orange, onion, parsley, and basil to a medium bowl. Mix together. Add in the lemon juice, lemon zest, pumpkin seeds, 1/4 tsp. salt, cayenne, paprika, and cumin. Toss to coat. 3. Once the barley is cooked, stir it in with the salad, or you can just serve the salad on top of the barley. Does anyone know of any good (and easily-accessible) home remedies for cluster headaches or migraines? Though I rarely have to deal with headaches like this, it would be nice to have something on-hand to help on days like today. I'm sure it would also be helpful to share with those who have to deal with these crippling headaches on a daily basis. Sorry about your headache / migraine :( I get both too (headaches usually from my neck / shoulders being tight, migraines who knows?!) and they are not fun. What does look fun is this recipe. So fresh and summery! And yes...this recipe is fun and summery. I'm getting excited because both tomato and strawberry seasons are about to start here in Florida. I saw some beautiful, bright red, and ripe tomatoes at a booth on the side of the road the other day and am beginning to regret not stopping to get any.